There's nothing quite like a rooftop to make you feel like you're on top of the world—literally. What's even better? Having a few drinks at a rooftop bar while you soak up the endless sunshine and cool ocean breezes of a Southern California summer. 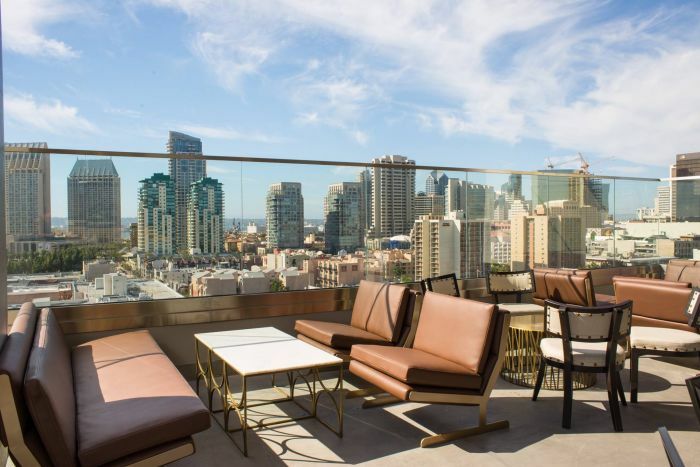 14 stories above the fray of downtown San Diego sits The Nolen, one of the newest editions to the Courtyard Marriott Gaslamp. 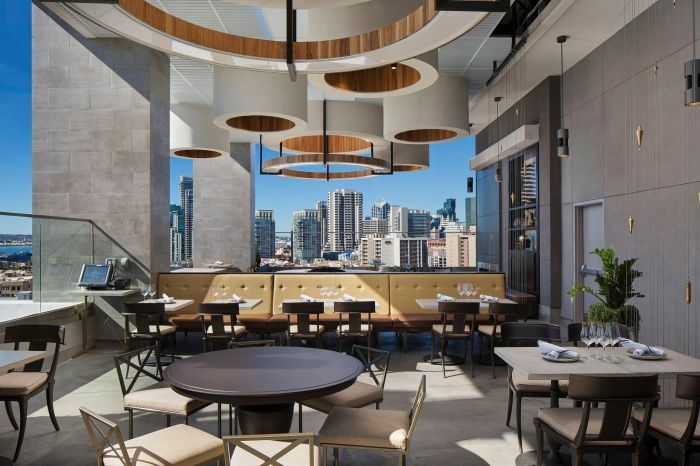 From the corner tables near the window, guests can see panoramic views of the Bay, Coronado Bridge, Petco Park, and the burgeoning East Village neighborhood. The bar is a tribute to John Nolen, a famed city planner that mapped much of San Diego's bayside at the beginning of the 20th century. Keeping with the turn of the century theme, both the decor and the libations are intended to resemble a modern speakeasy, complete with a secret doorway. A quick elevator ride up from the street entrace deposits you onto a open breezeway where the panoramic views of the downtown skyline threaten to steal your breath away. The first thing you might note (other than the view) is the massive communal fire pit situated near the patio. Dreamed up by local design firm Bluemotif Architecture, the open-air, contemporary chic decor marries masculine and feminine elements to create a space that feels both cozy and elegant no matter what time of day. Beer might be San Diego's golden child, but cocktail menus around the city have been giving some microbreweries a run for their money. It wouldn't be much of a gamble to say that the beverage program at The Nolen is leading the pack. This Memorial Day, at a special edition of their "Sunday Requirement" brunch, the bar unveiled their menu of summer sips. The menu was designed to have cocktails that are good at any time of the day, regardless of if you're building your own mimosa at brunch or taking the more adventurous route with one of their barrel-aged classic concotions. The barrel-aged drinks are one of the most unique aspects of the program—a large batch of a recognizable all-liquor cocktail (such as a Manhattan) is allowed to age for two to three weeks in an oak barrel that sits above the bar. The result is an strong, albeit more smooth, drink that can be enjoyed by someone who wouldn't normally order anything "on the rocks." It's not often that I stop what I'm doing, hold my drink up and say, "Wow, I might want to drink a million of these." The cleverly named Peat Rose by Luke Capozzoli is made with peat blended Scotch, black rose liquor, lemon, orgeat and pomegranate, topped with a dainty rosebud that swims playfully among the ice cubes. (Sidenote: in addition to being exceptionally delicious, the drinks are also really pretty.) Resident bartender Ian Rogers sat down with us to discuss how the menu was conceptualized, emphasizing that the team works together to cultivate a range of seasonal options that guests can enjoy no matter their pick of poison. Other standouts include the Not so Watermello by Valerie Bancroft, a tequila, watermelon and agave tincture concotion, and the Bronarmy Navy, which is a sumptuous mix of bourbon, cynar, lemon, orgeat and salt. 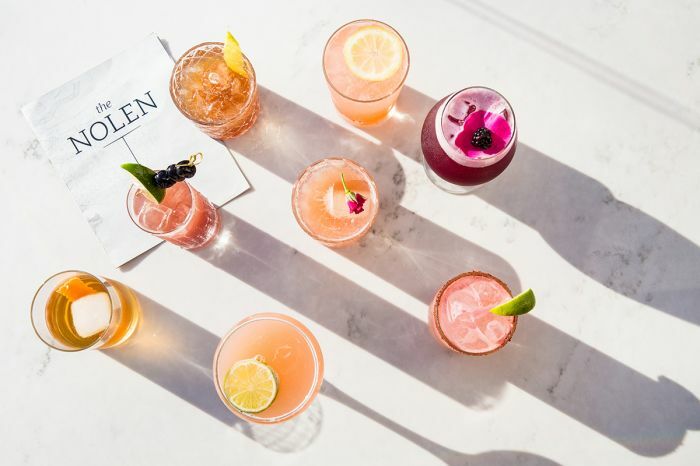 With all those different cocktails in rotation, you're probably going to need something to soak it all up; The Nolen's streamlined savory menu has you covered there. At brunch, comfort food connoisseurs will have their hands full with options like beer-braised short rib tot hash topped with carmelized shallots and fried eggs, or the carnitas benedict served atop cheddar polenta cakes. For those watching their waistlines, dishes like the proscuitto-wrapped shrimp or tuna poke are sure to satiate their appetite. 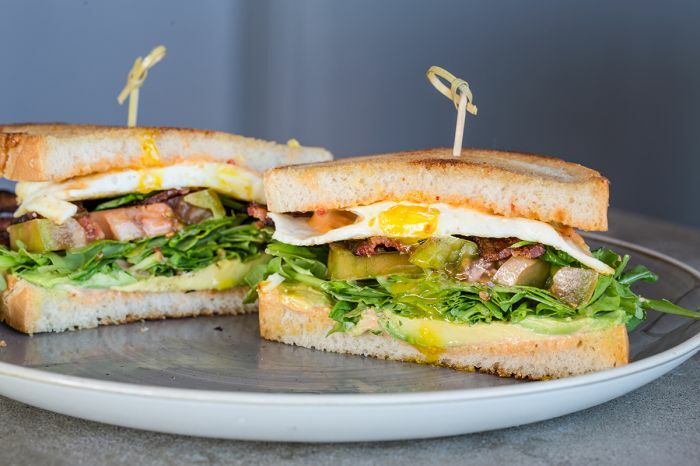 Both brunch and happy hour are popular times to see and be seen at the bar, with many guests dropping by for a few drinks before making their way to a Padres game or events being held downtown. The chic bar and lounge is often described as a "destination" rooftop bar, which is pretty accurate description, all things considered. The open, communal atmosphere makes The Nolen the perfect place to park yourself for a few hours with good friends, be it for brunch or happy hour. Treat yourself to a sunset beverage (and maybe a selfie with it) while you sit back and really grasp why San Diego is called "America's Finest City."